Research the natural defense mechanisms of various species of amphibians. Research the natural defense mechanisms of various species of reptiles. 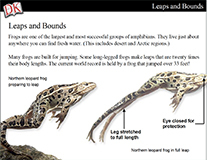 Students learn how species of amphibians and reptiles are classified. Interesting facts and fun activities related to the Canadian Turtle Derby. 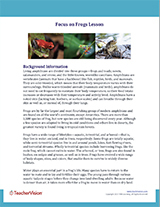 Try a printable science activity that focuses on the development of a frog. Students make fingerprint art depicting the life cycle of a frog.